WHAT IS AN INSPECTION USING DYE PENETRANTS? 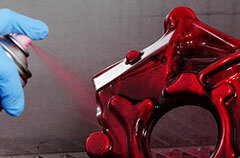 Testing by Dye Penetrants is a type of Non Destructive Testing enabling detection of surface imperfections in non-porous materials and basicallly consists of applying a flow of liquid to the surface of the material to be tested. The liquid, by capillary action, will penetrate the discontinuities and the excess remaining on the surface will be removed by a suitable cleaning system. The subsequent application of a developer will remove the fluid that was trapped by the discontinuities and so reveal their location. 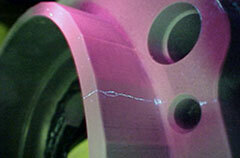 Penetrant removable with water / solvent removable / post emulsifiers. Results are obtained immediately and are very safe. 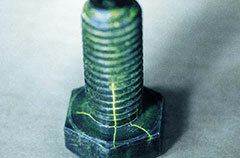 They are not limited to ferromagnetic materials such as Magnetic Particle Testing. The method is relatively simple, being easy implementated in the field. No specialist equipment is necessary.